Last Sunday night saw Borussia Mönchengladbach take an important victory against “The Eagles” from Frankfurt. And, as it turns out, “The Foals” have the chance to climb up the table very quickly in the next few weeks, because Gladbach play seven of the bottom table sides in the next nine matches. 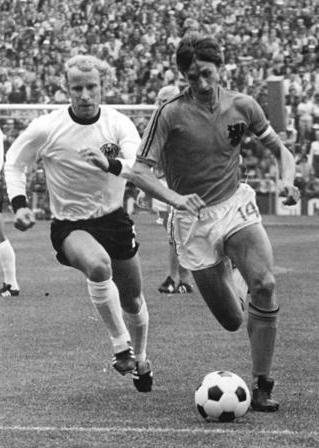 Berti Vogts chasing a player for the national team. Back in Gladbach's glory days pictures in newspapers were published in black and white. Posted in Borussia Mönchengladbach, Bundesliga, The battle against relegation and tagged 1. FC Kaiserslautern, Borussia Mönchengladbach, FC St. Pauli, Hamburger SV, Håvard Nordtveit, Martin Stanzl, Michael Fink, Michael Frontzeck, Micheal Bradley, Mike Hanke, Relegation, The Foals, TSG 1899 Hoffenheim, VfB Stuttgart, Werder Bremen. Bookmark the permalink.